Set in the 26th century, some 300 years after a world war, the survivors inhabit a post-apocalyptic scrapyard town, living in squalor beneath a floating city reserved for the privileged. 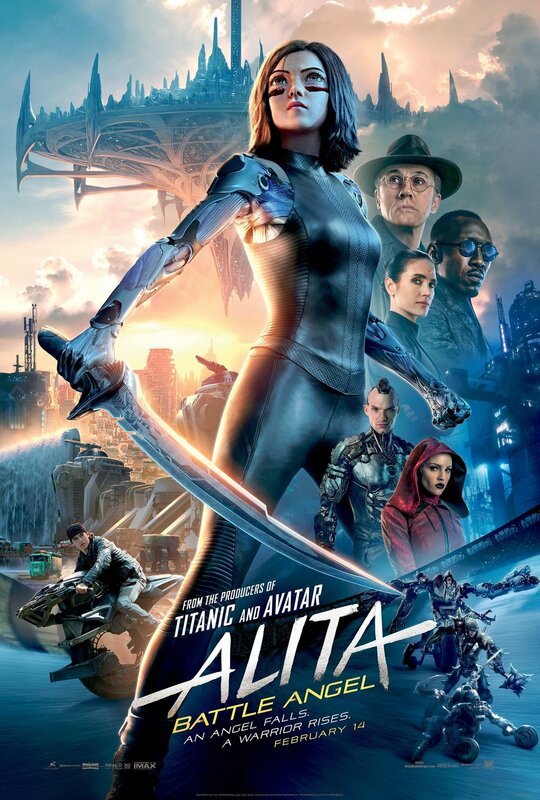 Searching through the trash for cyborg spare parts, Dr Dyson Ido (Christophe Waltz) finds the still-living remains of a cyborg body which he repairs but finds she has no memory of who she is or where she comes from, and names her Alita, but not even he can predict just how important she will be to the inhabitants of the city she now calls home. This is a hugely ambitious, CGI overdosed live-action adaptation of the cyberpunk manga of the (somewhat) same name – Battle Angel Alita. It was originally conceived by director James Cameron as a project for him until it languished in production hell while he focused on his soon to be released Avatar sequels. Like its namesake, it has been rescued from the scrapheap and brought to the screen instead by Robert Rodriguez with Cameron as producer – an odd pairing that reminds of the mix of Spielberg and Kubrick on the 2001 movie A.I. Artificial Intelligence. Whereas that mixing felt forced, most likely to Spielberg taking over after Kubrick’s death, here there is more of a collaborative merging of the two very different directors’ styles that is not the disaster it could have been and instead manages to balance well the flashes of Cameron’s technical brilliance with the impressively graphic and violent (yet restrained from his usual Tarentino-esque level) Rodriguez action sequences, as well as some character in the form of Alita’s ‘who am i?’ storyline. This intrigue is developed well, meaning that, despite having a plot that could be considered highly derivative of other cinematic content (Elysium, Robocop and Ghost In The Shell to name a few), some of which were probably influenced by the original manga, it also manages to feel fresh and be both thrilling and entertaining while also taking time to develop emotionally engaging characters. It does have its share of issues though. There are some poorly written character points, with Christoph Waltz’s Dr Ido initially being set up incredibly well but then rashly making decisions because the movie calls for it, and Jennifer Connelly’s Chiren feels especially underwritten; the movie has a very average 122 minutes runtime, so this more than likely is a result of editing to cut that down from a longer cut. The movie is rated 12A and while heavily CGI, it does have some aspects of cyber-body horror that you might not expect from James Cameron but should certainly expect from Robert Rodrigues, and while a lot is suggested rather than shown this rating is perhaps insufficient. Parents of those under 10 may wish to view the movie first to decide. The biggest failing of the movie is that narratively it is incomplete. The first of an intended trilogy, it ends confident that it will continue in a further movie similar to some of the recent teen novel movies like The Hunger Games, The Maze Runner, and The Divergent Series (and we all know how the third of those turned out) and I do hope that such a ballsy move is rewarded with box office success as overall, in a difficult genre, the movie gets a lot more right than wrong, and I would personally like to see where it goes.